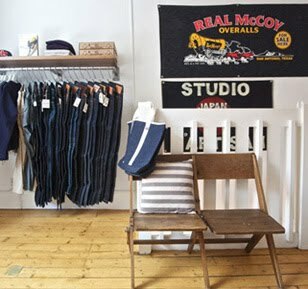 After looking all over, Ebay, Japenese Vintage sellers, and finding a fair few, the world of denims banners has opened up. 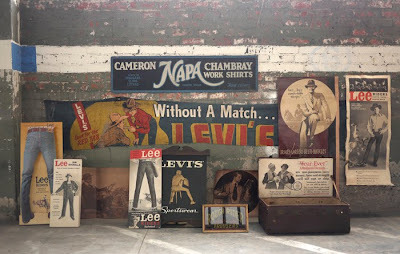 Such a cool way of advertising, esp as they use old Narrow Ring Ring Selvage Denim. Not only a work of art, but the denim its printed on is Antique. Two for the price of one, if your denim nut like me its one of the ultimate things to be hanging behide your head. Just look at Jason Denham, he has a few behide him... I can happily say Ive just secured this Real one, not reproduction from a japanese seller: check out the video of one just like it at antiques roadshow. 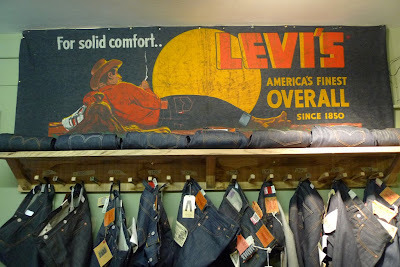 Levi's Cinch LVC Shop in London, has a vintage Banner from Ebay hanging above its Denim, enough said ! 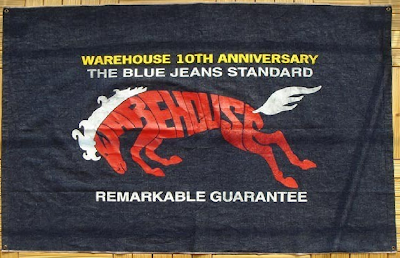 Of course its not just our friends at Levi's that do sort over banners - Wranger Bluebell, lee, Evisu, practically everyone has done this wonderful concept, and will continue to do so. Here are some others i have found while searching for mine, some are printed on card. I found your blog on Google looking for Union Special sawing machines. I was wondering if you could give me some tips. I have one in my ho use US 39200B (made in 1930). I know you have great knowledge about this industry. Is there a place where I can list it for sale or should I just try eBay? A few 39200's have come up on eBay. In the last few months. They are selling from $1000 to $2000 at the moment. They are hugely sort after, as they complete the set. ( if u have 43200g and 43200f) there seems to be a few on eBay at the moment, but the sellers are being greedy. One even selling at $5000, and it's broken. If your needles moving fine, and everythings smooth, list it on eBay, (if it its broken, sell it, some denim shop or studio would love to have it, even on the book shelf ) Is it only the machine head ? or with a table, with a table it's worth more. Give options when u sell it, with and without table etc. New Tables and motors don't cost a huge amount. Plus new motors are less noisy, and use less power. Most buyers will buy just the machine head. it's just if the buyers a nut case (like me) he might want the table also, then u have to ship it with freight company. Which will loads for buyer, but the great thing about eBay, u can give buyer the option. let them pay for everything.. do your home work, on how heavy it it, get quotes from post office / USPS etc....The great thing is these machines are small. USPS express / fedex is cheap. no more then 300USD to ship world wide. Make sure when u list it, put world wide, as there are lots if sellers in Europe and Asia looking, MANY! its not just US market. Good luck hope u get a lot$ for it. Take lots of pictures also ! Hi All, I have an Evis (evisu) Banner SUPER MANIAC est 1992 with the Layed down smoking cowboy the same as the levi banner. it is 6 foot wide and in Excellent condition. Currently Folded in a draw. Do you think it is worth any thing?? how do i upload it please my friend? I have the Levi look for the red tab, with the cowboy and lady on it. Any idea the value of this?